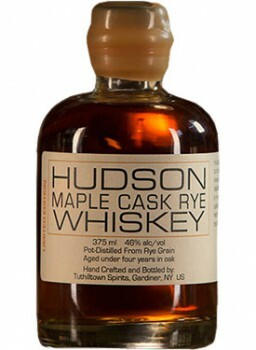 BourbonBlog.com is first to report that Hudson Whiskey will release a new batch of Hudson Maple Cask Rye Whiskey in the coming months. The original batch of this limited edition rye whiskey was released in 2013 and received praise for both its flavor and ingenuity. Unlike other maple whiskeys, a barrel exchange program gave birth to this creation. A local Hudson Valley maple syrup producer took used Hudson Whiskey barrels to create bourbon barrel aged maple syrups. After the producers had fully aged and dumped their syrup, the empty barrels found their way back to their origin at Hudson Whiskey. Hudson then filled the maple syrup cured barrel with a their fully aged rye to give their whiskey a unique finish. The rye is less than 4 years old and made from locally harvested New York rye grain. Be the first to know about whiskey updates like this one by subscribing to our free newsletter on this link.